All living organisms, including humans, animals, plants, and microbes, produce enzymes. Enzymes are biologically active proteins that are essential to virtually all physiological functions and biochemical processes. In short, enzymes are essential to life itself. 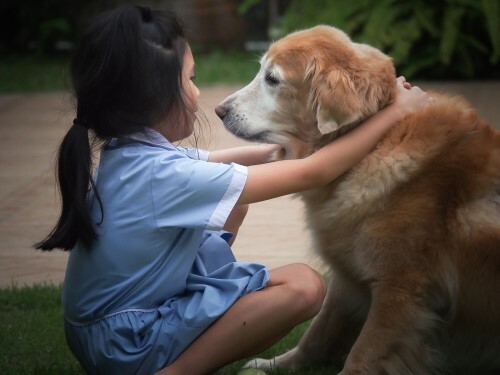 As our pets age, they produce progressively smaller quantities of enzymes and may require enzyme supplements to maintain optimal health, vigor and disease resistance. In addition to aging, certain drugs and toxins, such as antibiotics and heavy metals, respectively, can interfere with our pets’ ability to produce their own enzymes. 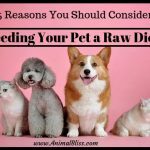 Although raw foods contain an abundance of natural enzymes, highly processed pet foods often lack these enzymes, which can be destroyed by the high temperatures and synthetic chemicals used in their production. Foods with a high sugar content or high glycemic index can also reduce a pet’s natural enzyme production. 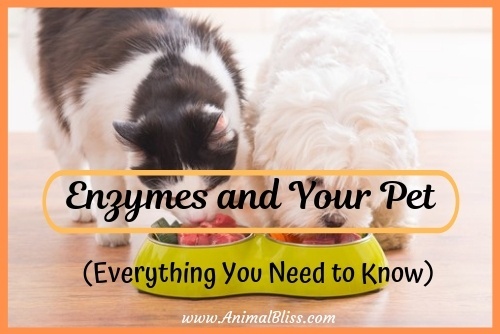 Here, we discuss enzymes as they relate to keeping pets healthy, including the different types of enzymes pets need. Enzymes are critical for the adequate digestion of food and the absorption of nutrients in animals and humans. The salivary glands, stomach, pancreas and small intestine produce digestive enzymes. Problems with digestion including excessive gas, chronic diarrhea, malnutrition, and even certain diseases, can result from a lack of sufficient enzymes. Digestive enzymes break down complex proteins, fats, and starches into simpler, smaller molecules that are easier to digest and absorb into the bloodstream as nutrients. Digestive enzymes are highly specific. Each enzyme reacts only with certain types of complex molecules. Because of this specificity, enzyme supplements often contain a mixture of several different digestive enzymes to maximize their effectiveness. For example, enzymes classified as proteases break down proteins into amino acids. Similarly, amylases break down starches into simple sugars, and lipases break down fat into fatty acids and glycerol. Cellulases, which are produced by bacteria and fungi (but not by humans or animals), break down plant fibers into glucose and short-chain polysaccharides. Different enzyme mixtures are formulated to aid in the digestion of meats, dairy products, grains, soybeans, and peanuts, all of which are common ingredients found in commercially available pet foods. Some enzyme blends also contain probiotics, which are mixtures of beneficial bacteria, yeast and other fungi that aid in digestion. Manufacturers can add blends of digestive enzymes directly to pet foods. Pet owners can also give them as a separate nutritional supplement, usually by mixing it in with their pet’s food. Digestive enzyme supplements are typically designed to withstand both acidic and alkaline conditions, so they remain active throughout the entire range of pH values found in a pet’s digestive tract. Some probiotics and enzymes incorporated into dry pet food during the manufacturing process are added following the application of heat. Others are specifically designed to withstand the high temperatures used in the manufacturing process. All enzymes added during pet food production are dehydrated first, so they have a long shelf-life and remain viable for an extended period. They become bioactive only when moistened by an animal’s saliva and digestive juices. Enzymes, probiotics and other nutritional supplements can enhance the health of a pet and increase growth by improving nutrient absorption and utilization. In addition to aiding in digestion, enzymes serve many other important physiological functions in a pet. These so-called systemic enzymes can improve the functioning of the immune, endocrine, and cardiovascular systems, as well as reduce inflammation throughout the body. Inflammation can have an adverse effect on many systems in an animal’s body, including the circulatory, skeletal and muscle systems. Certain systemic enzyme mixtures are specially formulated to help reduce inflammation that causes joint and muscle pain in pets and humans. Clinical evidence suggests that some enzyme blends may also support healthy blood circulation, platelet formation, and fibrin metabolism. Specific enzymes may be used to treat certain rare diseases in cats and dogs, such as exocrine pancreatic insufficiency (EPI). As the name suggests, EPI is a disease caused when the pancreas produces an insufficient amount of the digestive enzymes needed to break down proteins, fats, and starches in an animal’s diet. 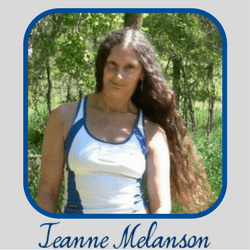 This insufficiency can result in nutritional deficiencies as well as gastrointestinal problems, including persistent diarrhea and unexplained weight loss. 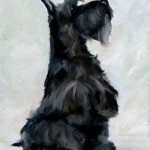 Treatment for EPI usually requires the addition of a pancreatic enzyme supplement to a pet’s diet. A veterinarian may also prescribe vitamin supplements and dietary modifications to treat this chronic condition. 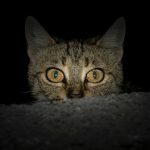 A more common problem seen in both cats and dogs is “otitis externa,” which is a generic term referring to a bacterial or fungal infection of the external ear canal. It is usually accompanied by itching and, if left untreated, can cause significant pain. The usual treatment is a course of oral or topical antibiotics, which may include the use of an ear wash or ear drops containing anti-bacterial and anti-fungal agents. These cases can take weeks or even months to resolve. According to one estimate, ear infections in pets can be attributed to environmental or food allergies in approximately 80 percent of reported cases. Ear infections and skin problems are likely to be chronic conditions in pets prone to allergies. Unfortunately, the repeated and prolonged use of antibiotics can result in the development of resistant strains of bacteria, eventually rendering antibiotics ineffective in controlling the condition. Rather than waiting for an ear infection to occur and then treating it with antibiotics, a more effective solution is to use a preventative regimen incorporating enzymes. Preventative measures using enzymes have no risk of causing bacterial resistance or digestive upset. 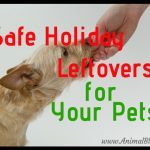 If a pet’s ear infections or skin problems are related to food allergies, it may be advisable to supplement the animal’s diet with digestive enzymes and probiotics. These can aid in restoring the natural balance of enzymes and beneficial bacteria in a pet’s gastrointestinal tract. This process is particularly important if the animal has been on antibiotics, which can destroy beneficial gut flora. On the other hand, if a pet’s chronic ear infections are attributable to environmental allergens, such as pollen, mold, dust mites or fleas, prophylactic treatment of the ears with an enzymatic ear solution may be more effective. 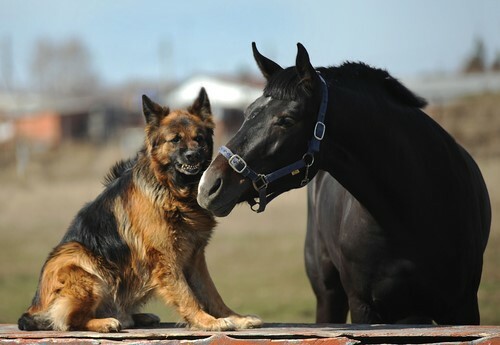 Enzymatic creams, sprays, shampoos and conditioning rinses can be useful in treating various types of skin problems in pets and horses. Some of the enzymes used in these products include protease, amylase, cellulase, and lipase. Oral gels containing enzymes are also available to treat “dry mouth,” bad breath and gum disease in pets. The advantage of these products is that they don’t contain antibiotics and, therefore, do not lead to antibiotic resistance. Enzymes are clearly of vital importance to the health of any pet. 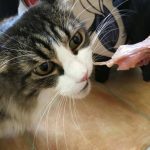 While it is true that pets, like all living creatures, produce their own metabolic enzymes, advancing age, disease, and environmental factors can reduce this natural ability to generate enzymes. Digestive and systemic enzyme supplements can address this deficiency and help pets lead long and healthy lives. Guest Writer: Morgan Walker Clarke is a writer and dog lover from Dallas, Texas. He has 10+ years of writing experience and has been a pet parent for over 20 years. In his spare time, he enjoys taking his dogs to the park, watching football, and spending time with his wife and twin sons.